This right here is the most photogenic highlighter ever. Game over. Just take a look and marvel at its beauty. 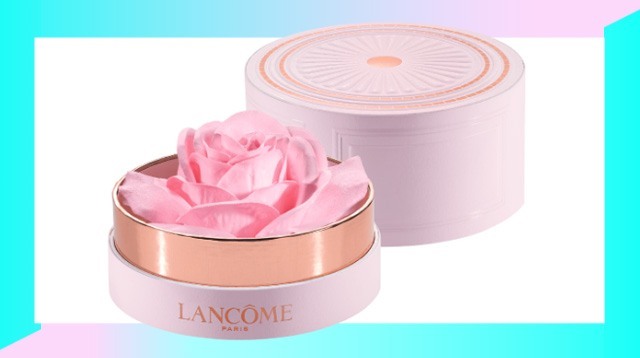 The highlighter box is called La Rose a Poudrer by Lancôme, and it legit has a light pink rose inside that's covered in luminous highlighter powder. You might be asking yourself, Uhh, how are you supposed to use it?, but it's as easy to use as it is beautiful. Using your highlighter brush (or the matching Parisian Kabuki Brush), lightly swirl the bristles over the petals and then swipe it on the high points of your face (your cheekbones and brow bones) for a natural, softly highlighted effect. Both the highlighter and brush are part of the spring 2017 limited edition collection and will be available for purchase in the US this January. Soon (but not soon enough), you can snag the brush for $34—around P1,685—or go straight for the highlighter for $60—around P3,000.